My first week with Knight Transportation Squire CDL training. For anyone who wants to know what to expect. Last Friday I was scrambling trying to figure out how I was going to make it to Phoenix, AZ from Lincoln, NE since my last company wasn’t able to get me to Phoenix like they promised. I ended up booking a rental, drove and made it to Phoenix on Sunday morning. Knight reimbursed me for the fuel and rental fees which was pretty cool. My recruiter had my hotel room ready for me at the comfort inn and suites for the next 3 weeks and to my surprise we aren’t sharing rooms, everyone has a room to themselves... which is great! I’ve heard plenty of stories where companies try to pair you up with someone or have dormitory style sleeping arrangements. I was afraid of that because I like my own space to relax at the end of the day. Knight paid for our lunch on the first day which was cool, and they’re virtually paying for everything. If we have to take an Uber or Lyft, submit that receipt and they’ll reimburse you. Our group that started Monday was the first group to not have to learn manual shifting because the company recently switched all their trucks to automatics. I was thrilled but then again not too thrilled because I was looking forward to learning how to shift, it could’ve made me more marketable if I ever chose to go elsewhere. I was told that if I wanted to add manual shifting to my CDL I could later add that endorsement... so that’s cool if I ever wanted to go that route. Our day starts at 5AM, the shuttle bus comes to pick us up from the hotel at 5:45AM and at 6:00AM we are at the terminal. At 4PM we take the shuttle back to our hotel. Our first day was mostly classroom, learning how to log, HOS (hours of service) and other important things we may need to know while out on the road. Day 2 you’re out on the range learning pre-trip and air brakes test. On day 2 we were split up into groups of 3 and head out onto the main road to learn right/left turns, and later mixed in with more pre-trip and air brakes tests. Day 3: We went out for some more driving, and once we returned to the range we started learning how to straight back, offset parking and parallel parking. We also mixed in more pre-trip and air brakes tests. Day 4: We are cycling through everything we previously learned and perfecting it. Day 5 (which is today): We had an evaluation on our pre-trip. We were able to miss 19, I missed 16. Although it’s still passing I still have some work to do. Driving is something you have to get used to because that trailer is something else, it’s very sensitive and the slightest turn will move it. 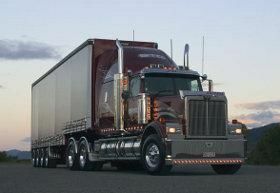 Once you learn that you are driving the trailer and not the truck things become much easier for you. READ and retain YOUR PRE-TRIP & AIR BRAKES TEST like it’s the freaking BIBLE!!! You can miss a certain amount on your pre-trip, and I’m not really sure how many it is in any other state but here in Arizona it’s 19. You cannot miss anything on your Air brakes test or else it’s an auto-fail. That’s the advice I have to give so far. A lot of us were getting too wordy with pre-trip, I’m sure out of nervousness.. but when you do that you tend to forget a few things. Say what you have to say, hit your points and keep it moving. It’s my first week but I’ve learned a lot so far, if you have any questions feel free to ask... I’ll answer to the best of my ability.